Since when is it okay for the Government to tell Facebook what to do? 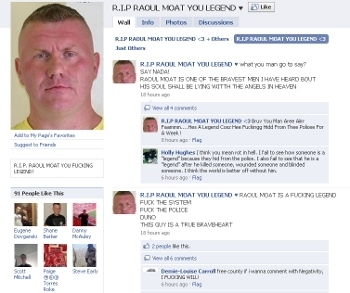 The award for ‘Storm in a Teacup’ UK news story this week goes to the controversy over a Facebook tribute page dedicated to killer Raoul Moat, but it did raise a worrying point. It was widely reported on Wednesday that the UK government had asked Facebook for the page to be removed and that Facebook had refused. The page was later removed by its creator for reasons unknown and the controversy died a death. Story over? Well only kind of. The really worrying part of the whole affair was that in the media storm over Facebook’s refusal to remove the page, it wasn’t once asked whether it really was acceptable for the government to censor social media at will. There’s some debate over the exact role the government played in this whole storm. Reporting varied over exactly who asked for what to happen, but as Paul Clarke notes in an excellent post about the affair, it doesn’t really matter what the truth is. The fact is that the news media failed to question whether the government had any right to decide something online should be taken down simply because it didn’t like it. If something’s illegal, sure take it down, but if a few people feel sympathy for a mentally disturbed killer who has committed suicide you can’t censor their feelings just because you disagree with them. It sets a dangerous precedent. With exception of very few countries, the Internet is a place that allows and thrives on free expression. If we forget that, we’re on a slippery slope. As a punchline to the story, at least three copycat tribute pages have now been published, including the one we’ve pictured above. Read next: Let it snow app suggestions with Flurry AppCircle.